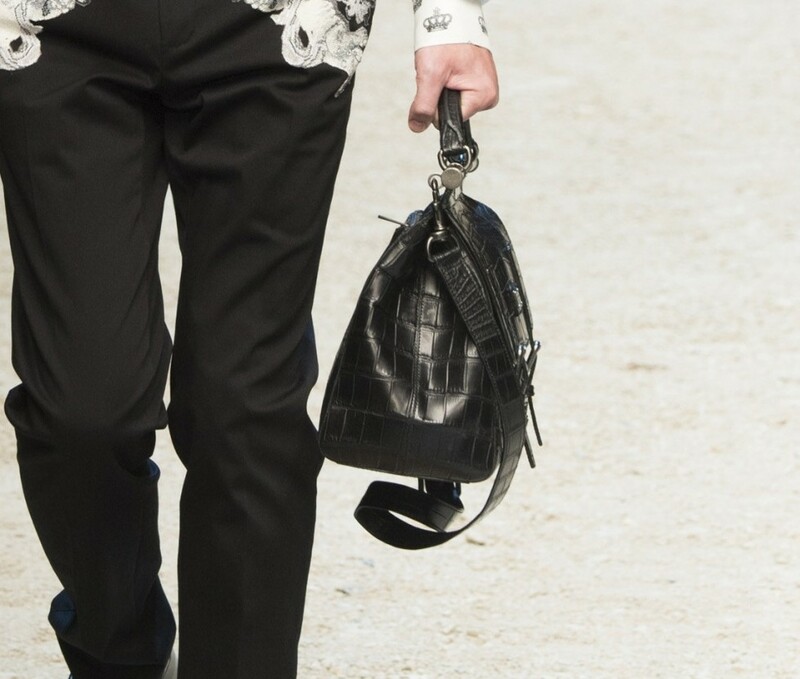 The accessory that is going to dominate men’s fashion world in 2016/2017 is the men’s bag. All types of men’s bag, of course: handbags, wristbags, work or travelling bags, night or day bags. First of all there is the backpack, already considered the “bag of the future”. The most original idea seems to be that of Dolce and Gabbana: a bag with the resemblance of a backpack but to be brought by hand. The bags created by Armani are minimal, while Fendi relies on the checkered texture all over. Travelling bags should be chosen with discernment: this year no trolley, but a leather or canvas travelling bag to be brought by hand or on one’s shoulders, for the important thing is to bring with you all the necessary. To travel by flight canvas travelling bags are ideal for they are very light, even though leather bags (synthetic leather), remain always cool for men to be used travelling by car or by train. Most of these travelling bags have shoulder straps so to be easier to transport. Among the models of the moment there are those colored with camouflage effect produced by Replay. The models by Paul Smith are also interesting with their completely printed texture, and so are those by Marc Jacobs that present a geometric micro weave. An absolute ‘must have’ and an always very desired item is the men’s travelling bag by Burberry, characterized by its iconic checkered weft. Black leather travelling bags by Saint Laurent and Montblanc confirm their elegance and seduction thanks to their clear, sober and tasteful style. We cannot miss the casual proposals by Calvin Klein, Napapijri, and the EA7 Emporio Armani. Pitti Uomo also creates trendy bags for Fall/Winter 2016/2017. They are very exclusive models realized with innovative materials and original shapes, from briefcases to sporty chic rucksack, from shoulder bags to shoppers.